Julie Bogart is the creator of the award-winning, innovative Brave Writer program, teaching writing and language arts to thousands of families each year. She's also the host of the popular podcast "A Brave Writer's Life in Brief." Bogart homeschooled her five now grown children for seventeen years and is the founder of The Homeschool Alliance, which supports homeschooling parents through coaching and teaching. "Success in homeschooling is more about mindset than method, and relationship than academic minutiae. Julie Bogart unpacks what this looks like for her in powerful and practical ways that will inspire you to personalize your own homeschool journey." “Breathes fresh life into your homeschool days." "The Brave Learner is the book I would have adored as a young parent. Julie's wise advice, genuine humor, and refreshing honesty wrapped me in a spirit of hope and possibility. This is a joyful book brimming with generous, practical ideas about how to live and teach at any age. I only wish I had more children! "Julie’s voice is personable, encouraging, informative, and reassuring. 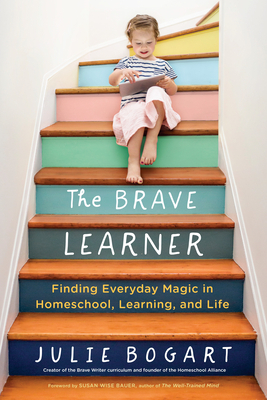 The Brave Learner is filled with inspirational and practical tips on helping children thrive whether you're a homeschooling parent or not."